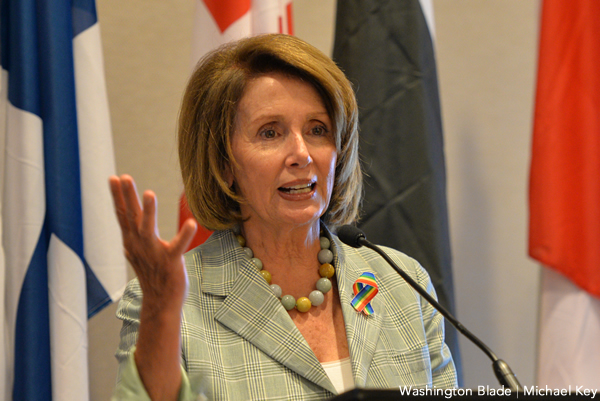 The goal of all Democrats in 2018 should be to see Nancy D’Alesandro Pelosi (D-Calif.) have the opportunity to announce she won’t run again in 2020 after getting sworn in as Speaker of the House of Representatives in January 2019. Pelosi is a force of nature and politician extraordinaire. She grew up in a political family in Baltimore, her dad first serving in Congress and then becoming a three-term mayor. She was elected to Congress in her own right from San Francisco in 1986. Since that time she has fought the good fight for liberal/progressive causes and in 2007 was elected Speaker making her the highest-ranking woman politician in American history. When Republicans took over the House in the 2010 elections Pelosi was elected Minority Leader. Now Democrats have the chance to make her speaker again. In a June 2017 New York Times column it was reported “Since entering the House Democratic leadership in 2002, Ms. Pelosi has raised nearly $568 million for her party. Just in the 2016 election cycle, she raised over $141 million.” The column went on to say “her allies say she supplies much more than cash, praising her ability to impose member discipline and her skills as a “back-room dealer,” in the admiring words of Representative Dina Titus, Democrat of Nevada. Representative Steve Cohen, Democrat of Tennessee, hailed her deftness at “herding cats.” It’s been a lot of work for her to kind of keep us away from impeachment and on health care and the economy,” Mr. Cohen said. So whatever the negatives of having Nancy Pelosi as a focal point for Republicans to criticize and use in their ads, in the long run Democrats have benefitted from having Pelosi as their leader. It seemed to many she was grooming Chris Van Hollen (D-Md.) to take over but he decided to run for the Senate in 2016 and is now the junior senator from Maryland. Senate Minority leader Chuck Schumer (D-N.Y.) actually waited until he was sworn in to name him chair of the Democratic Senatorial Campaign Committee (DSCC) based on the work he did as chair of the Democratic Congressional Campaign Committee (DCCC) and the trust Pelosi put in him. Pelosi is working to ensure Democrats take back the House in the 2018 mid-term elections. She is also walking a tightrope on dealing with the issue of sexual harassment in Congress. She named Ben Ray Lujan (D-N.M.) as DCCC chair and they elected five vice chairs at the beginning of 2017 to help recruit candidates and set the message for the 2018 election cycle. Vice chairs include Reps. Joseph P. Kennedy III (D-Mass. ), A. Donald McEachin (D-Va.), Betty McCollum (D-Minn.), and Jared Polis (D-Colo.) who is now running for governor of Colorado, and Ted Lieu (D-Calif.). Last year ended with big wins for Democrats in New Jersey, Virginia, Alabama and victories in races across the country from county council to state legislatures. So Democrats who are clamoring for Pelosi to step down now should stop those efforts and focus all their energy on winning not only the House and Senate, but governorships, and legislatures across the nation. Pelosi is smart enough to stay out of races where her name is a negative. Her skill at fundraising and her ability to keep Democrats together in the year leading up to the mid-term elections in November clearly outweigh any negatives attributed to her. Democrats need to stop the infighting for the next year and instead work together to win. Stop all the speculation about who will be our Presidential candidate in 2020 and focus all our energies on 2018. If we can win the House, maybe even the Senate, and some governorships the field of candidates vying for what will be a valuable nomination will be large and include many of the names we know and some we don’t know yet. So let’s focus on making Pelosi speaker in January 2019 at which time surely she will see the wisdom in announcing it will be her last term in Congress. Then maybe some of our other respected elder statespersons will follow suit and recognize it’s time for a new generation of Democrats to take center stage. The elder statespersons in the Party should put their egos aside and use their experience and wisdom to help the next generation of Democrats succeed. Until the fake potus is forced to resign for sexual harassment all calls for other politicians to do so ring hallow! The goal must be to control a chamber of Congress until the fake potus is ousted and a Democrat takes over. That will put the breaks on his destructive agenda! However, don’t be naive enough to think this time should not be used to identify a strong solid candidate with no baggage to run against trump! Take nothing for granted! Picking the right person is equally important and nothing to slap together at the last minute! If you want fresh New Democrats then it’s the presidential slot where this will matter most to give voters someone to rally around with renewed enthusiasm like Obama provided! I’m not going anywhere. Muahahahahahahaha!